Home > Business Intelligence, SQL Server, SSAS	> BIDS No More Exist in SQL Server 2012. BIDS No More Exist in SQL Server 2012. Once you will installed SQL Server 2012 you could not find the BIDS to develop SSAS/SSIS/SSRS application. BIDS will replace with SSDT i.e. SQL Server Data Tools. Comparison of SQL Server 2012 Vs SQL Server 2008 R2. 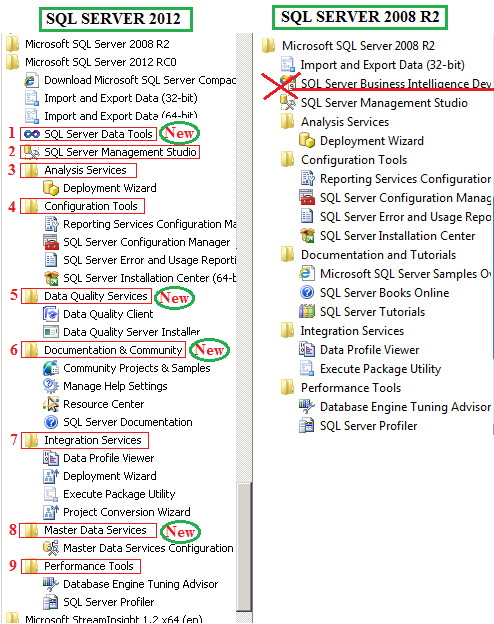 You can get more idea on below Screen shot how SQL Server 2012 looks compare with SQL Server 2008 R2 components. So in SQL Server 2012 we have below four new components available. Today will discuss more on SSDT i.e. SQL Server Data Tools. SSDT having below 2 uesed, Will discuss the how we can use SSDT one by one.. Developing Databases in Visual Studio like working in SQL Server Management studio. If you are looking for BIDS (Business Intelligence Development Studio) in SQL Server 2012, then you will not find it. It is replaced with SQL Server Data Tools (SSDT) in SQL Server 2012. 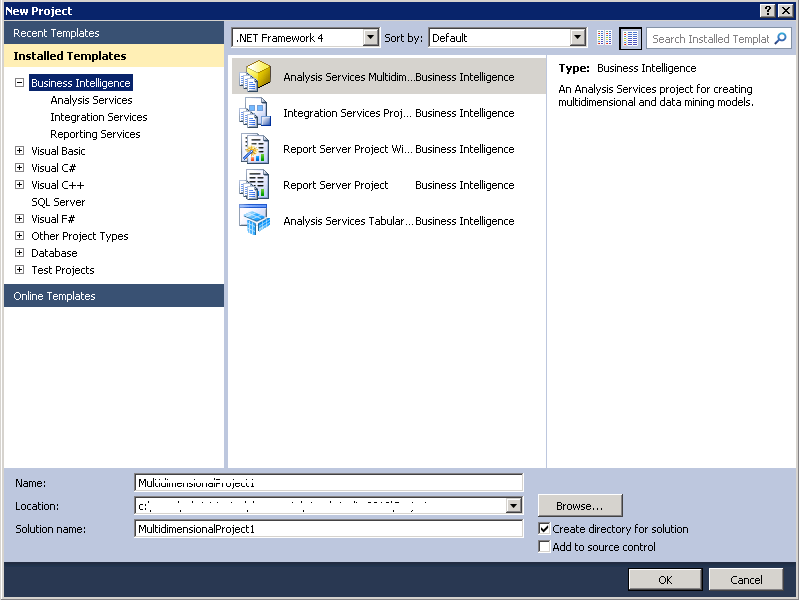 You can start the SSRS/SSAS/SSIS Projects as we created in BIDS in SQL Server 2008/R2. SQL Server 2012 installs “SQL Server Data Tools” under the “SQL Server 2012” Start Menu option – this includes BIDS but not Database Projects. In this use can create the SSAS Tabular Projects called as BISM. 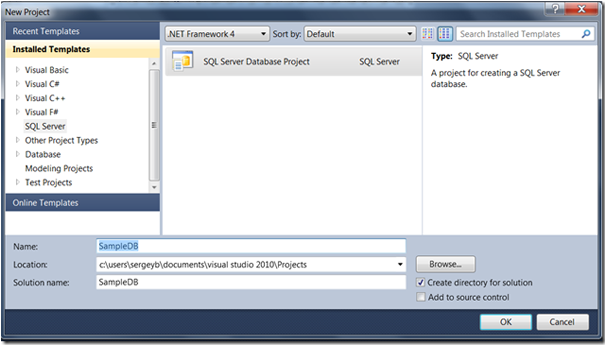 2-Developing Databases in Visual Studio like working in SQL Server Management studio. In this you can create new Database Design features with schema management etc in Visual Studio more like working in SQL Server Management studio. The idea is that developers want to develop databases using similar methods to working with regular (i.e. .NET code) object within VS. To that end, SSDT includes offline projects, object creation interfaces (i.e. for tables, views, etc…) schema snapshot and compare, database version targeting (for SQL Server 2005, 2008, 2012 and for SQL Azure) and refactoring with preview. Database Projects installs “MICROSOFT SQL Server Data Tools” under the root of the Start Menu – this doesn’t have BIDS functionality included if installed separately. 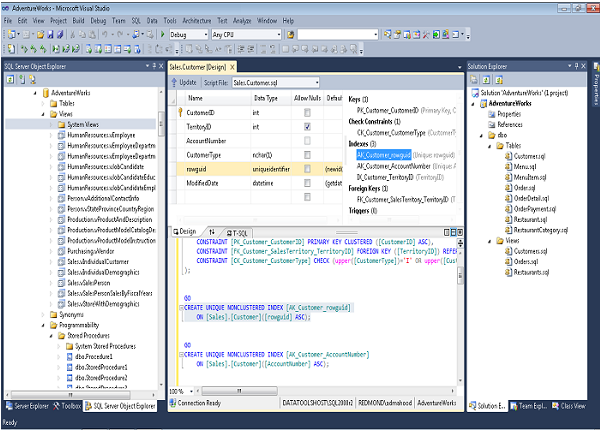 Responsive SSDT’S GUI as compared to SQL Server Management Studio. Fast and reliable build of deployment scripts. Detection of isolated changes in the target database. Resolve references to other production and system databases like msdb & databases connected by a linked server. Support of migration scripts to enable data preservation and to add static data. Possibility of executing and deploying a single file.